This post is part of an ongoing series featuring amazing views from hotel rooms. In each post, we select a country, region or city and find the one hotel there that — in the independent opinion of Spot Cool Stuff’s travel editors — offers the best views from all of its rooms. We give bonus points when guests can enjoy the view from their hotel bed. Factors we do not consider when making our selection include the views from the public areas of the property or the quality of the hotel itself. Check out our other reviews of hotels with the best hotel room views here. 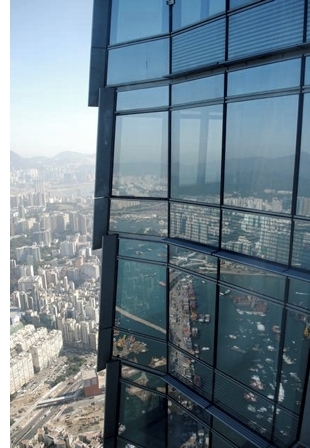 The view from the Ritz-Carlton rises above that on offer at Hong Kong’s other sky scrapper hotels — literally! The Ritz-Carlton is located within the 490 meter (1,608 ft) high International Commerce Centre (ICC) building. 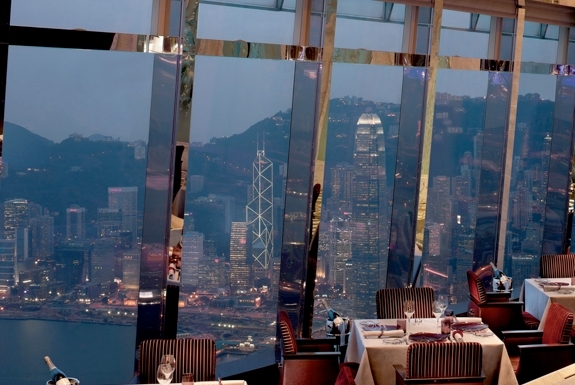 The closest-to-the-ground room at the Ritz-Carlton is higher up than any other room found in any other hotel in Hong Kong (or in the rest of China, for that matter). 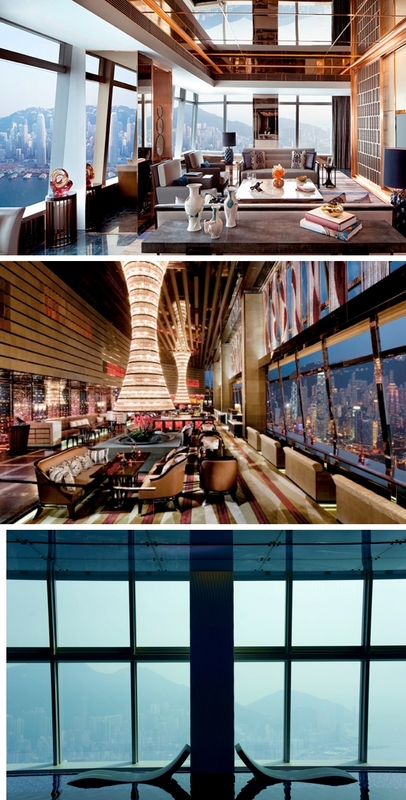 In fact, at the time of writing, The Ritz-Carlton, Hong Kong is considered by many the tallest hotel in the world. A stay at the hotel, though, starts at low altitude, at a few meters above sea level. That’s where you’ll find the Ritz-Carlton’s comfortable if small lobby. After check-in, you hop on the guest-only elevators to be rocketed upwards. The hotel’s restaurants, bars, swimming pool, spa and 312 guest rooms are all located between floors 102 and 118 at the very top of the ICC! The elevators can make that trip in a brisk 52 seconds. Walk into your room and your heart may skip a beat when you get your first glimpse of the view beyond your room’s large nearly-floor-to-nearly-ceiling windows. This is when it hits you: You might have previously stayed in a hotel room with a five digit room number, but never before did the first three digits represent the floor you were staying on! Most rooms have a cushion seating area right next to the window where you can lean right up against the glass and test your reaction to vertigo. Inside your room you’ll find amenities of the sort that you’d expect to find at a high quality Ritz-Carlton property: large flat-screen televisions, high tread count sheets, luxurious furnishings, et al. And if your room is a corner suite there will be one amenity not found at any other Ritz-Carlton property: a telescope. Voyeurs might be disappointed that no other hotel room interiors are peek-in-able. But the telescope is fun for spying on boats and gazing at the urban landscape across Victoria Harbor. Whether your room has a telescope or not, it will have complementary — and fast — wifi internet. Many of Hong Kong’s luxury hotels charge significantly extra for internet access, so kudos to Ritz-Carlton for doing the right thing. Nearly all the hotel areas beyond the rooms are oriented towards enjoying the window rooms too. Most impressive is the swimming pool, which lets you swim up right up to large windows and enjoy the views from the water. There’s also an outdoor jacuzzi — separated from a long fall down by a thick wall of glass. The hotel’s spa, bar and restaurant areas are all set up to take advantage of the window views too. Though one downside of staying at the Ritz-Carlton is that all the restaurants are extortionately expensive. For the most part you get what you pay for, especially at the Tosca restaurant, which arguably offers the best Italian food anywhere in Hong Kong. But for reasonably priced eats you’ll have to head 100+ floors down to the shopping area at the base of the hotel building. Or, better still, get a club level room. That comes with complimentary access to the 24-hour lounge with an excellent buffet. The lounge serves up get breakfast, light mid-day meals, afternoon tea, evening hors d’oeuvres, chocolate treats and late-night snacks, almost eliminating the need to eat anywhere else. (Spot Cool Stuff, being vegetarian, was especially pleased with the lounge’s noodle and vegetable soup offerings.) 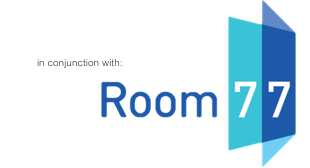 The surcharge for a club level room can be rather steep — US$200 or more above a non-club room — but you can recoup some of that by getting the best room rate on meta search site Room 77. Another downside is that the hotel isn’t within walking distance of any of Hong Kong’s major tourist attractions. Though the close proximity to an MTR station mostly negates this disadvantage. And, in any case, anyone in Hong Kong can go visit its tourist attractions. 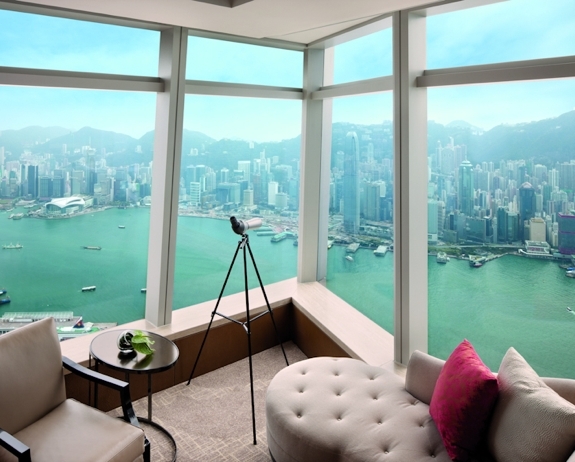 To see the city from 100 floors high — without getting out of bed — for that you must stay at the excellent Ritz-Carlton, Hong Kong. 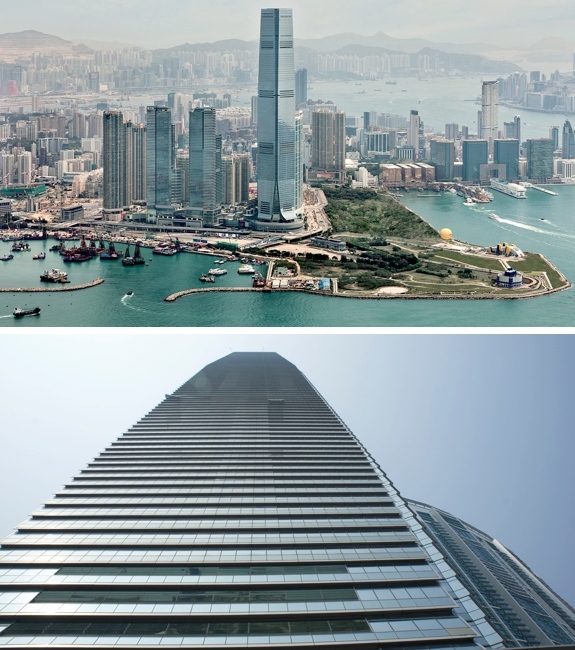  Some people disqualify the Ritz-Carlton Hong Kong from consideration as a tall hotel because the entire height of the building is not devoted to hotel use. The world’s tallest building that’s a dedicated hotel is the JW Marriott Marquis Dubai — or at least it will be after it officially opens in December 2012. 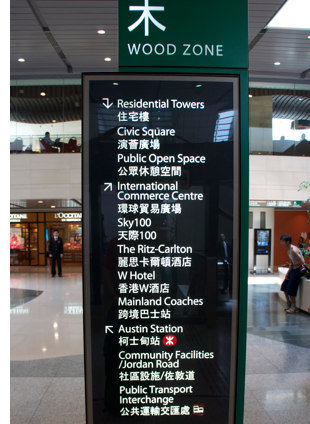 Getting there: The Ritz-Carlton is located above Kowloon Station, though to get from an MTR train to the hotel lobby you’ll have to follow a series of signs (like the one to the right) through a maze-like shopping area. Conveniently, Kowloon is a stop on the Airport Express; you can travel between the airport and Kowloon Station in about 20 minutes. Picking a room: Absolutely no room has a bad view. The best are from corner suites. The highest floor with guest rooms is the 117th — all the accommodations here are in the club category (see above). Family friendly? Though kids are allowed, the Ritz-Carlon, Hong Kong has an adult vibe and none of the facilities, from the pool to the restaurants, have a particularly family-friendly set-up. 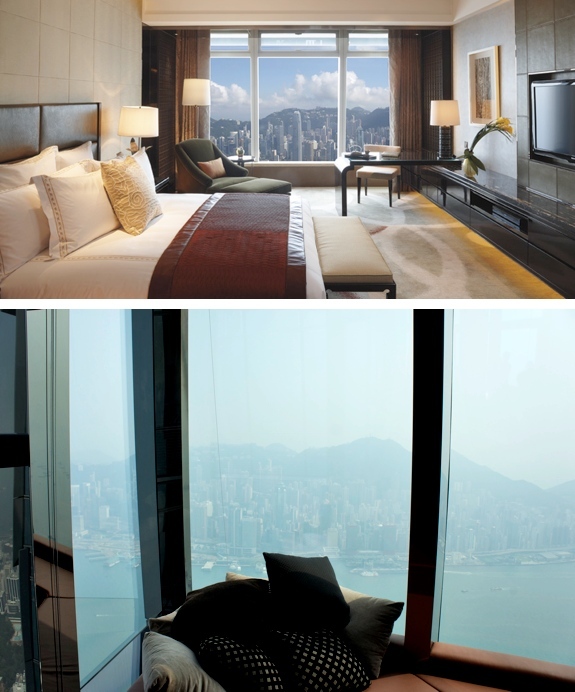 For a family-friendly luxury hotel, consider staying in the Four Seasons Hong Kong instead. Heading to the airport on a late flight? You can check your bags at the Airport Express ticketing area in Kowloon Station a few hours ahead of time. You’re then free to spend the rest of your day downtown luggage-free before the quick run to the airport for your flight. Wow amazing view! I wish i was there for the holidays and woke up seeing that every morning. Good shots!